A collection of articles about star wisdom (astrosophy), including a complete sidereal ephemeris and aspectarian. 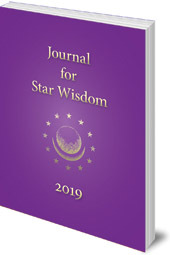 Cosmology Reborn: Star Wisdom is the new name for the Journal for Star Wisdom. It includes articles of interest concerning star wisdom (astrosophy), as well as a guide to the correspondences between stellar configurations during the life of Christ and those of today. This guide comprises a complete sidereal ephemeris and aspectarian, geocentric and heliocentric, for each day throughout the year. This edition is edited by Claudia McLaren Lainson and Joel Park, taking over from Robert Powell. According to Rudolf Steiner, every step taken by Christ during his ministry between the baptism in the Jordan and the resurrection was in harmony with -- and an expression of -- the cosmos. The Journal for Star Wisdom is concerned with these heavenly correspondences during the life of Christ. It is intended to help provide a foundation for cosmic Christianity, the cosmic dimension of Christianity. It is this dimension that has been missing from Christianity in its two-thousand-year history. This year sees the publication of the first volume of the series Star Wisdom—Cosmology Reborn. This title was chosen in commemoration of a lecture given in 1919 by Rudolf Steiner, 'Cosmogony, Freedom, Altruism', in which he indicates the development of a living Cosmology to be the task of the Anglo-American West. The first article in this volume by Joel Park illuminates this lecture from the standpoint of Astrogeography. This is followed by an article by Robert Powell, in which he describes the development of Astrosophy, and introduces a new, galactic perspective for casting horoscopes. Claudia McLaren Lainson, in her first article, addresses the historical gesture of Saturn-Pluto conjunctions. This is followed by a second article from Joel Park, in which he outlines his recent around the timeline of the events of the Parzival story. A vision from Estelle Isaacson is included, on the theme of the miracles of the Second Coming. This is followed by an assessment by Kevin Dann as to how well Cosmology has been able to arise in America since 1919. Julie Humphreys offers an illuminating piece on the historical gesture of Uranus in Aries. Then comes Claudia McLaren Lainson’s second article, which gives a hermetic perspective on the events of our time. The final article is an otherwise out of print piece from the archives of Robert Powell on the Lunar Calendar. Claudia McLaren Lainson is a teacher and therapeutic educator. She founded the Waldorf program and Windrose Farm and Academy in Colorado. She lectures nationally on various topics related to Spiritual Science, human development, the evolution of consciousness and the Christ and Sophia mysteries. Joel Park is a coworker at Plowshare Farm (a Camphill affiliate) in Greenfield, New Hampshire. He is inspired by the work of Robert Powell.